Dorothy Livesay was a writer of journalism, short fiction, autobiography and literary criticism, Livesay is best known as a strong, sensitive poet dealing as capably with public and political issues as with personal and intimate emotion and reflection. She was senior woman writer in Canada during active and productive years in the 1970s and 1980s. Her mother, Florence Randal Livesay, journalist, poet and translator, and her father, J.F.B. Livesay, general manager of the Canadian Press, encouraged her literary efforts from her first publication, Green Pitcher (1928). 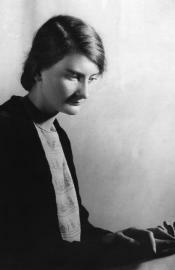 Educated at the University of Toronto and the Sorbonne, she worked in left politics during the 1930s, and subsequently won Governor General’s Awards for Day and Night (1944) and Poems for People (1947). She trained as a teacher, taught in Northern Rhodesia [Zambia] 1959-63 and served as university writer-in-residence. She published prolifically, and her lifelong concern for women’s rights and the identity of the woman artist ripened with time.